I was telling a friend today it’s that time of year that two things happen to me: I decide I want a baby like right now and that I only want to wear sweaters and jeans. Since 9 months stands in the way of the first thing happening, I shall go with a simple pair of jeans and a sweater. It’s the cheaper alternative, really. Also, this is not an announcement that I am having a baby. But this is an announcement that at some time in my life I will hopefully have a baby around Christmas time. Till then, I shall hold my dog baby tight and dress him in children’s clothing and wigs. hahahah! my dog is my baby too, and i always get baby fever around the holidays too! love that sweater! happy holidays! Love love love that sweater, by the way. So cute. If the thing about your dog baby in clothes and wigs is true, which it probably isn't, then you must post photos online. Oh, I feel exactly the same way. Christmastime is the only time when I can honestly picture myself wanting a baby. Giving presents and dressing cute kids up in winter clothing is the best. Also, I am obsessed with those shoes! Are those cutouts or studs? 1. My dog baby doesn't cry or keep me up at night – and she totally looks adorable in Christmas clothing – so I'm with you there. 2. I love your sweater AND your jeans. I really need to get in on the boyfriend fit thing. Two years late in the game. & I thought I was the only one… I always want to send out those sweet little announcement-picture-Christmas-card-thingys, they are too adorable. Alas, I'm not pregnant (on purpose), but my friend is & she got to send out those card-thingys, so I shall live vicariously through her! Oh, & love your shoes! I still think of the lost, crazed poodle sign you posted here. Maybe he would have been cuter in a wig. Love it – HAPPY HOLIDAYS! Please post your dog outfits and wigs. Maybe he needs a blog too??? lol I'm trying to picture the dog with the wig. I love that sweater. 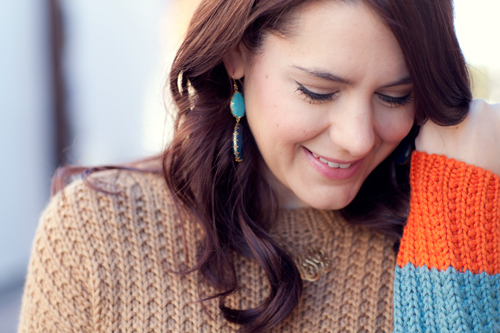 Lovely sweater and beautiful earrings! That sweater looks so incredibly comfy!! Love the booties, too!! Absolutely love the sweater and I have the same jeans. They are so comfortable! I have to force myself not to wear them everyday! you may want to rethink the baby at christmas! my little guy was born last year on the 22nd and i'm already getting sad about people not being able to make his first b-day party b/c of christmas plans. 🙁 i think we are going to do some half birthday celebrations in the future! Poor dog! 😉 I adore your shoes!! With a sweater like that, I'd want to wear it all the time too! That sweater is so adorable! Oh my man, when you have kids, they are going to be the most stylish tikes on the block! ha ha! need to see a photo of your dog in children's clothing and wings! Dog babies are a great filler while waiting for baby babies 🙂 Have a Merry Christmas! Meh, I'm not into babies. I'm much more into sweaters. So I'm happy with what's going on here. Great sweater! I love it when you dress casual. It makes my casual look frumpy, but I'm okay with that. I just need to find cuter shoes w/o heels b/c heels and my feet are not friends. Feeling the same things around here, too! We're contemplating our 3rd, and all I want to wear is sweaters and jeans! But I only have a couple of sweaters – might need to shop! My sister is the one carrying the baby right now (her 2nd), not me. I'm still enjoying my regular sized clothes! Love the color combo on that sweater:)! lmao. It is so hectic having kids with December Birthdays. My two have the SAME bday at the beginning of December and it is unreal. Aim for March, and loan me that sweater since you will be growing! Love this outfit. I could live in sweaters and jeans :). Having a child around Christmas time is so much fun. Seeing Christmas through their eyes is magical. I love it. love the sweater! cute outfit! Just a perfect outfit!! 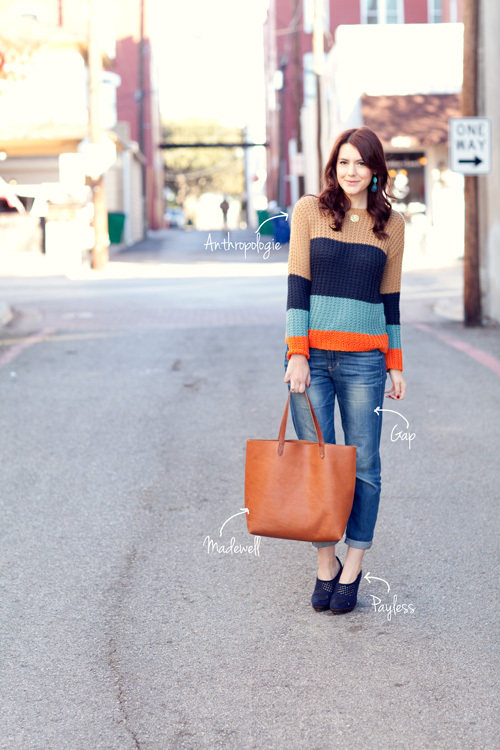 Love a good sweater and boyfriend jeans! I demand pictures of said dog-baby in cute clothes, STAT! Gorgeous colors and you look lovely! You look so pretty! The color combination is flawless as well! Great outfit! Two things: Have a baby by next Christmas; this is my favorite outfit of yours. Having kids around at Christmas is wonderful (I have 4 yr. old twins). They just get so excited, it's priceless! Love your looks, so simple and chic. Wait you with a baby – that would be the most precious thing ever!!!! Can't wait to hear that announcement 🙂 And this sweater… so gosh darn cute! Babies are good. Dogs in wigs are…disturbing. Love that sweater. you say two i say four "i want your sweater" go make that baby! So simple but so pretty! Love your pretty earrings! Maybe Santa will bring the baby this year. This look is awesome on you. Absolutely LOVE that sweater and the colors! Can never go wrong w stripes. Also, got the shock of my life may 2010 when I found out I was due w a surprise baby last Christmas. I'm happy to hear you LIKE the idea of having a Christmas baby! Mine's a gem who turns one on Christmas Eve, and was a fantastic little Santa surprise. Plus I'd love to see 6 mos of maternity posts from you! That is such a lovely sweater! Boo! Babies are too expensive! Stick with jumpers. xoxowww.prettylittlefawn.blogspot.comPS: Head over to my blog if you love cat dresses, vintage, thrifting, clogs and whimsy! I'm right there with you, but in sweatpants and a less attractive sweater. Bahaha! I love reading your posts they're always so humorous! I agree with you I love wearing simple jeans and a sweater! So easy and so cute. you are just too funny! 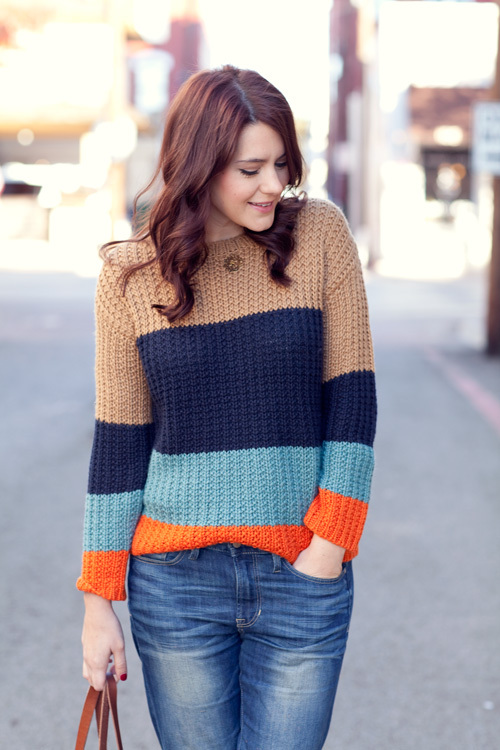 love the sweater, colors are amazing…. in that first picture you look a little but like jenny lewis. hahah I love this post. (: Great look! Nothing is better than a good pair of jeans and a cozy sweater! You are so funny! But I totally agree with wanting a baby around the holidays! I had my son end of Oct so he would be little and cuddly for the holidays!! I absolutely LOVE the shoes & the sweater! Way cute! I usually just create a Pinterest board dedicated to babies / baby clothing / baby style / baby room decor / baby activities and that makes my desire for children go away. Also I realize I'm 19 and can barely manage to put gas in my car let alone care for a human being. But ya know. Love the boyfriend style jean on you and the payless heels are too cute! God, I love Antropologie! Such a great mix of colors on your sweater! Are you planning to reinstate 30 for 30? I only discovered it after the last one ended, and I, and I am sure many others, love the idea. Love that sweater! I want it! And your booties are cute too. By the way, you're not the only one who treats their fur baby as a human baby. My little Todd eats it up! That sweater is awesome! And your shoes look perfect with it! Love it! The sweater is PERFECT! This is one of my absolute favorites. You look so darling all the time but there's something so feminine and graceful you've added to the basic sweater and jeans. beautiful! how do you maintain the red in your hair? Sweet but at the same time precise. 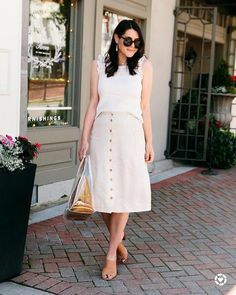 Cute post and outfit! Wishing your wishes for a chrismas baby may someday be a reality! I am loving the navy! And dont worry, i dress up my cat lol. You.are.hilarious. Fingers crossed for a Christmas baby for you so poor baby Carlos can give up wigs and children's clothing. Really like the color block sweater! It reminds me of J.Crew's version of the color block sweater. Great find! I want to see the dig wigs! So where do I start if I want to look cute but don't know how??????? I bought the bag. Enough said! Is it wrong that I want you to have a baby just so I can ooh and aaah over your maternity fashion? Of course even if you got busy rightthissecond it wouldn't do me any good since I'm already 7 months along. Ah well. You are so adorable! Love love that sweater.